I couldn't stand the look of the red oak panels I made, so I plunked down the cash for a real 1/4" teak plywood panel. From it I crafted two replacement panels for the aft cabin bulkhead. 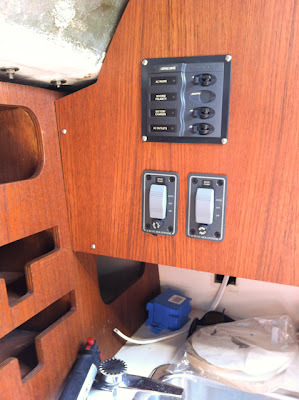 This gave me a home for the AC main panel and the two bilge pump switches (primary & secondary). At this point, only the primary is installed, but I wanted to reserve the space for #2 when the ambition hits me. After quite a bit of trial and error I went with Minwax "Gunstock" stain on the panels after a thorough sanding with 220 grit paper. It looks very close to the original finish that was on my boat. I have no idea whether or not my finish is factory original, so your mileage may vary. I'm very pleased with the color though. After the stain dries, I put on two coats of Lemon Oil and it ends up looking absolutely beautiful. I think I'm going to make an access panel to mount the controls in so that I can get to the wiring behind with less fussing. I'm pretty sure a survey will turn up that recommendation, but for now I just wanted to get it done. On the opposite side of the cabin I have flush-mounted the VHF radio, and will soon be adding a stereo right underneath it.